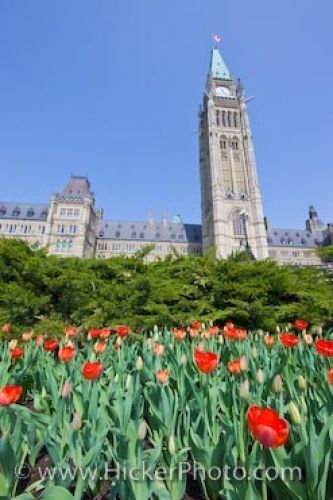 Looking up from the bright red tulips is a view of the Government buildings with the Centre Block and Peace Tower in the city of Ottawa. Centre Block and Peace Tower of the Parliament Buildings is located in the City of Ottawa. The Gothic Revival architectural style of Parliament Hill is timeless and classic in its details. Construction was started in 1916 and completed in 1927. Centre Block and Peace Tower of the Parliament Buildings and a garden of Tulips on Parliament Hill, City of Ottawa, Ontario, Canada.